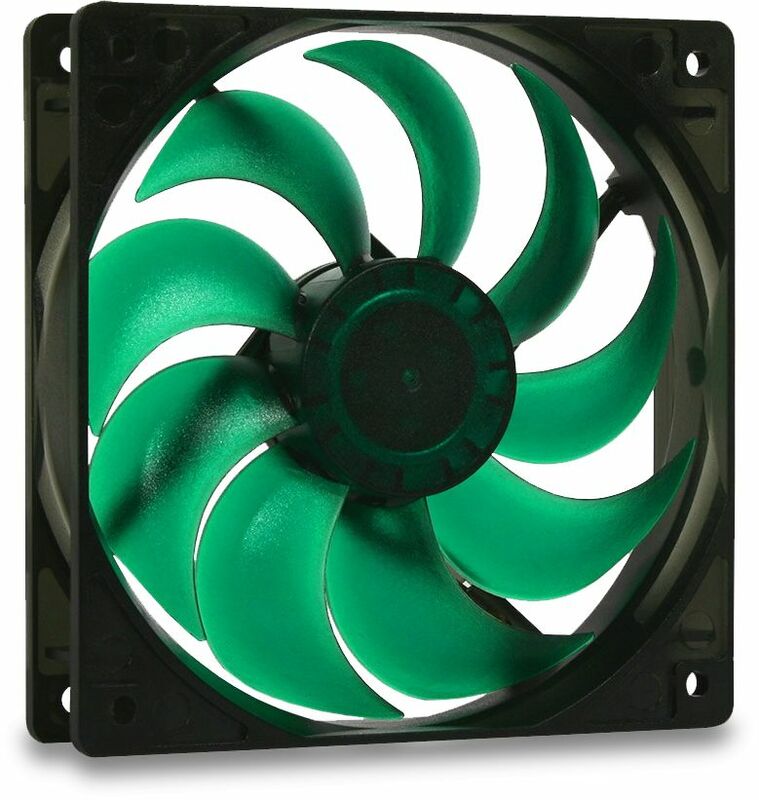 This 120mm fan from Nanoxia is the same fan found in their excellent Deep Silence cases and therefore recommended if you plan to add more fans to the DS cases. Unless a fan controller is available, the power and speed of the Deep Silence fans can be customised according to your individual requirements, using the included 7-volt adaptor cable. Please note that the 120 mm and 140 mm models of the Deep Silence Nanoxia fan series are used in all Deep Silence cases. If you intend to add more fans to your Deep Silence case, it is highly recommended that you choose these fans since they perfectly harmonise with the included fans to provide optimum controllability of your system. The 120 mm models of the Deep Silence fan series are supplied with a 7 volt adapter cable. At 12 volts the fan rotates at 1300 revolutions per minute. The Deep Silence 120 mm generates an air flow of 60.1 CFM at a noise level of 14.2 dB(A). 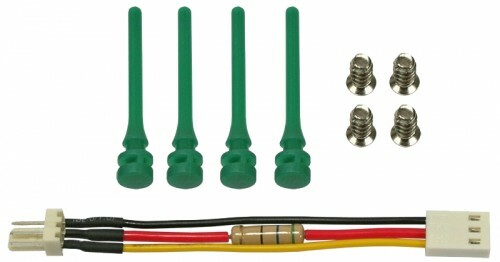 Using the 7 volt cable reduces the speed to approx. 900 rpm, which generates and air flow of 26,5 CFM at 8.6 dB(A). I have been a customer of Quiet PC for several years and have bought several PC cases and various components, fans etc., from them. I have always had good and helpful service from them in spite of the fact that I live in Spain. So when I decided to get a quieter and less power-demanding case for my best PC I naturally turned to Quiet PC again. There, I settled on a Nanoxia Deep Silence 1 case. It is very reasonably priced and is also very well constructed and designed for best ventilation and ease of use. As I was in the frame of mind for a major transition to the speed and stability of SSDs I also ordered two Samsung 850 Pro 512 GB drives, an additional Nanoxia Deep Silence 120mm Ultra-Quiet fan for the top of the case’s ventilation ‘chimney’ (as it can get very hot in Spain) and a Scythe Kaze Master Fan Controller – because I like to be able to see the speed and running temperature of my case fans. The Deep Silence 1 comes with a built-in two zone fan controller for 4 fans but has no visual display. It has been a few years since I built my last PC so as soon as I started to load my existing Asus motherboard and its RAM and Intel CPU I realised that there were more advanced items out there now, so I upgraded the entire innards and now have a really fast machine that makes virtually no noise at all. As always, Quiet PC delivered the parts right on time and I now have the quietest PC I have ever had. It runs so quietly that the only time I can actually hear it at all is when the CPU is chewing on some data. Other than that I don’t even notice it under my desk. It was a great purchase from an excellent company. This case is very smart, well designed to maximise ventilation and space, and, as always, Quiet PC delivered everything on time and with excellent service. I bought two of these to use as intakes for the front of my PC. They're great quality and were easy to install. I have a 'silent' case with noise absorbing foam which traps heat as well so needed better cooling. These fans have brought my idle and load temps down considerably, I would quote but I can't reliably say what they were before. GPU idles at 26C and after hours of gaming it has maxed at 68/69C (with single 23" 1680x1050 monitor). Temperatures drop rapidly after finishing gaming. CPU idled around 36/37C before and now idles at 29/30C. They can be controlled fairly well by software. They only minor con is they're slightly louder than anticipated but this is easily managed by slowing them when idle and they're not loud enough to be noticed when gaming.